He said that those who wish to pull the US and Israel apart "will fail. Our shared values are too deep, our shared interests are too strong, our shared destiny too intertwined." "But having said that, I must tell you that we must never take anything for granted. Those who seek to defame this great organization AIPAC, those who seek to undermine America's support for Israel, they must be confronted. 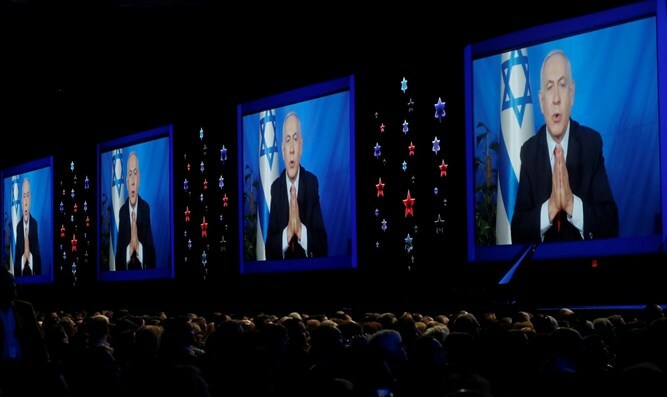 Despite what they claim, they do not merely criticize the policies of Israel's government. In Israel that happens every five minutes. They do something else. They spew venom that has long been directed at the Jewish people. "Again the Jews are cast as a force for evil. Again the Jews are charged with disloyalty. Again the Jews are said to have too much influence, too much power, too much money," he said. "Ladies and gentlemen, do you know what the best way to respond to this kind of hatred is? We read it just a few days ago in the book of Esther, when Mordechai confronted Haman of Persia. The best way to respond to those who espouse this kind of hatred is not to bow down to them, it's to stand up to them! "The Jewish people do not bow down. We stand up, we fight, and we win!" Netanyahu declared. "My friends, ladies and gentlemen, some people will just never get it. They’ll never understand why the vast majority of Americans – Jews and non-Jews alike – support Israel.